← The Breakfast Club (1985) – OBEY! CONFORM! 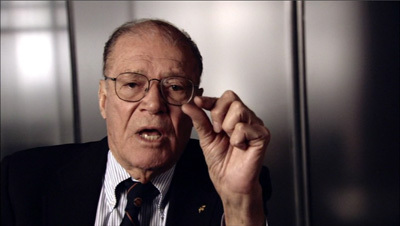 The full title of the film is The Fog of War: Lessons From the Life of Robert S. McNamara, and the former US Secretary of Defense gives his lessons direct to camera. Morris uses a device called “Interrotron”, which gives the impression that the speaker is making direct eye contact with the viewer during the film. McNamara was born during World War I, prematurely declared “The War to end all Wars” by president Woodrow Wilson. During World War II he advised General Curtis LeMay during the bombing of Japanese cities. This sets the theme for the whole film. During his lifetime, McNamara has been declared an evil warmonger, but he was never the person directly making the decisions. More powerful men were acting on his advice. “If we’d lost…we would have been tried as war criminals.” McNamara admits, regarding the devastating carnage wrought upon Japan. It is said that history is written by the victors, and if that is the case, McNamara’s testimony cannot be trusted. If the 20th Century was the American Century, he was involved in authoring some of its most bloody and dramatic chapters, and one of the failures of the last century was that the Americans continued to behave as victors, even when they started losing. Their record in the conflicts talked about here is won one, drawn one and lost one. McNamara’s testimony appears candid, but there is always the sense that we are listening to a shrewd political operator of keen intellect. He continuously tries to exonerate himself by admitting someof the blame, but stops short of accepting full responsibility. After the Second World War, McNamara ended up working for Henry Ford, where his number-crunching abilities gave him the opportunity to save lives – his analysis of car crash stats led to safer cars and the introduction of the seat belt. His meteoric rise led to Presidency of the Ford Motor Company, then to the White House, when he received a call with an invitation from John F Kennedy. McNamara’s recollection of the Cuban Missile Crisis, where America and Russia pulled back just in time to avert a Nuclear War, is an engrossing opening to the film. “We came this close” McNamara says, and you believe him, because one thing McNamara doesn’t seem capable of is hyperbole. The largest portion of the running time is devoted to Vietnam. The conflict in Southeast Asia is clearly the subject McNamara feels most guilty, contradictory and defensive about, although tape recordings of conversations between him and Presidents Kennedy and Johnson appear to exonerate him. On one tape, he is heard recommending the withdrawal of troops to President Kennedy; on another, he is chastised by Johnson for recommending the withdrawal of troops. Confusing and unsubstantiated claims of a North Vietnamese attack on a US Destroyer led to the increase of American military activity in the area. 58,000 American troops died in what was a damaging and demoralising war for the U.S.
That one human being has the power to start a nuclear war is frightening, and McNamara declares that the combination of human fallibility and nuclear weapons will destroy Nations. Once again, you believe him. This is a powerful and gripping documentary, morally complex and intellectually stimulating. McNamara has been demonised and celebrated, but Good or Evil? Absolutes are rare in humans, but McNamara’s soul is clearly tainted by the deaths of the thousands of people his advice was complicit in. However, he is also a man with the intellect to realise that not all decisions are good ones in times of conflict – Lesson Number Nine: “In order to do good, you may have to engage in evil.” A cynical viewer may hear that and say, “You keep telling yourself that, mate.” – after all, we are talking about a self-confessed war criminal. It is easy to be cynical when you haven’t been forced to make those kinds of choices. The Fog of War is a challenging documentary about a man who helped shaped some of the key events of the last century. Director Morris skilfully avoids making it just a talking head documentary – while it is essentially almost two hours of an old man talking to the camera, Morris interweaves McNamara’s testimony with a fluid montage of archive footage which alternately support or counterpoint his story. The film overall has the handsome gloss of a prestigious, multiplex-worthy documentary, enlivened by crisp, judicious editing and Phillip Glass’s evocative yet unobtrusive score. If Robert McNamara was your history teacher, you’d pay attention. 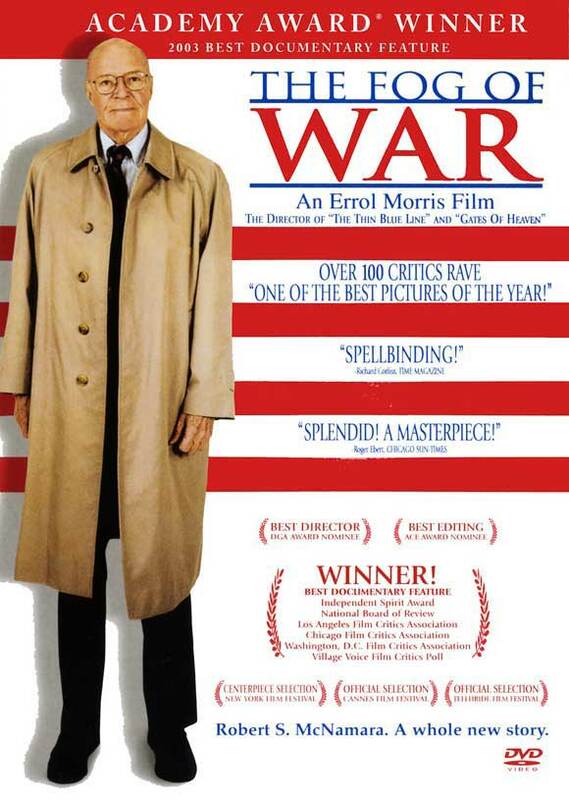 Posted on 15/03/2015, in cinema, Documentary, Entertainment, Film, Movies, Reviews, War and tagged The Fog of War 2003 documentary, The Fog of War 2003 Errol Morris, The Fog of War 2003 Robert McNamara, The Fog of War: Lessons From the Life of Robert S. McNamara 2003. Bookmark the permalink. Leave a comment.